You know those girls who wear Nats caps, but in pink? Don't be one of those girls. Please. Don't. Pssh. The Nationals seem to think that to lure women into the park, they have to offer us free massages, manicures and shop-ops of makeup and handbags. Well, they don't HAVE to do that. But it sure helps. The Nats are holding another Ladies Night this Thursday, June 4 at Nationals Park (1500 S. Capitol St. SE). Hit up the all-inclusive pre-game happy hour, 4:30-7 p.m. (It SO beats tailgating in a dusty parking lot, while trying to avoid your brother's friend with that annoying laugh, who keeps trying to hit on you ... just sayin'). 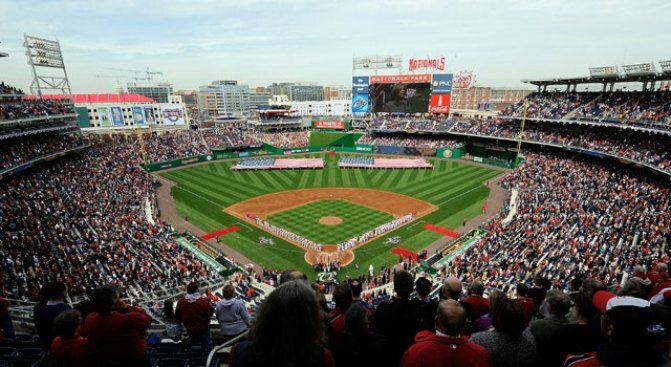 During the pre-game event, not only will you get to, well, "pre-game," you'll also get the chance to meet Nats players and other celebs, cash in on those beauty treatments we mentioned above, and shop for jewelry, handbags and cosmetics. DJ Chris Styles will be spinning tunes throughout. Tickets are $30 for both the all-inclusive happy hour and a field-level game ticket to see the Nats battle the San Francisco Giants (a $100 value). Even if guys think we can't do math -- uh, hello, our SAT scores were way better than yours -- we have to admit that's a pretty sweet deal.